These cakes are perfect for an appetizer or serve with a fresh garden salad. I added them to my Superfood Kale Salad and made an entire meal. It was delicious! Prepare Artichoke Cake Batter: Using a food processor, break up the nori sheet, place it in the food processor, and pulse the nori sheet until it has a powder consistency. Remove from the food processor and place in large mixing bowl. Add the artichokes hearts to the food processor and process until smooth. In the large mixing bowl, add all of the patty ingredients and mix well. Place the batter in the refrigerator while you prepare the sauce. It will help the cakes keep their form. Caper Sauce: Place all ingredients into a bowl and whisk until blended well. Cook Patties: Preheat a large skillet over medium-high heat with a couple tablespoons of olive oil. With your hands, form small golf ball sized patties. Place in the hot skillet and flatten with a spatula. Cook until each side is browned, approximately 3 minutes per side. You may have to cook these in batches depending on the size of your skillet and size of the patties. Add more olive oil as needed between batches. 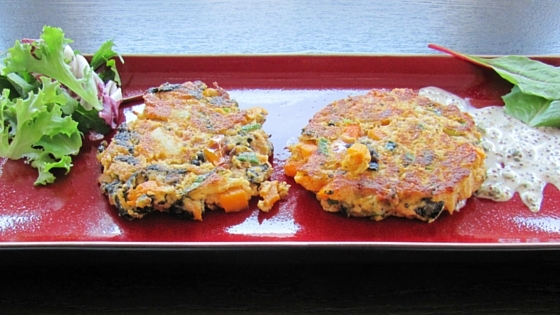 Place patties on serving platter and serve with caper sauce.